A 42-year-old man initially presented to the emergency room with a 6-month history of gradually worsening lethargy, dizziness, imbalance, confusion, short-term memory loss, intermittent headaches, and worsening slurred speech. He was subsequently diagnosed with cerebellar medulloblastoma and had a subtotal tumor resection followed by craniospinal radiation. He suffered severe radiation toxicity and did not receive chemotherapy. Follow-up craniospinal imaging has been negative for recurrence; however, he is now presenting 3 years later with a palpable subcutaneous nodule in the nuchal soft tissues near the inferior border of the old nuchal incision scar. 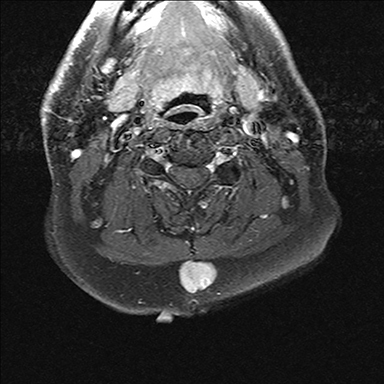 MRI of the neck without and with contrast revealed a well-circumscribed posterior midline subcutaneous mass at the inferior aspect of the healed incision measuring 2.2 cm by 1.7 cm transaxially. The mass demonstrated homogeneous T1 and T2 prolongation and enhancement following the administration of Magnevist intravenous contrast (Figures 1-3). Additionally, the mass had mild diffusion restriction. The mass was approximately 1 cm deep to the skin and abutted the superficial muscular fascia. A PET-CT performed after resection of the nodule demonstrated no additional metastatic disease; however, no pre-operative PET imaging was performed. The pediatric and adult five-year survival rates vary based on risk-group stratification at diagnosis, ranging from 58-84%.1 In patients with extraneural metastases, survival rates can be as low as 36%.3 Postoperative recurrence is common, reported between 50% and 60% with a median recurrence time of 30 months, although late recurrence is more common in adults than children.1 Given the nature of medulloblastoma to spread along cerebrospinal fluid pathways, the most common site of recurrence is in the posterior fossa.2 Extraneural metastases are rare, occurring in 5%-15% of cases.3 Approximately 90% of these are osseous metastases.3,4 Tarbell et al,4 in their study of 50 patients treated with surgery and craniospinal radiation, reported a 38% CNS recurrence rate and a 12% rate of systemic metastasis, all bone. In a study of 23 medulloblastoma patients ranging in age from 1 to 40 years old with systemic metastases, Eberhart et al3 reported a 91% rate of bone involvement, 13% soft tissue/lymph node involvement, and a 4% (one case) rate of lung metastasis. Their reported median time to metastasis was 18.5 months, ranging up to 11 years after initial treatment. With respect to surgical seeding of disease resulting in metastases, several studies implicate ventriculoperitoneal (VP) shunt placement as a risk factor for developing extraneural disease.2 Only one case report was found describing a case of subcutaneous seeding of medulloblastoma. 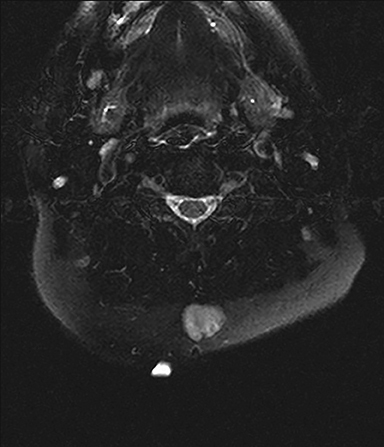 Galarza2 et al reports a 6-year-old male patient who was diagnosed with cerebellar medulloblastoma and treated with VP shunting, tumor resection, and craniospinal radiation. Four months later, he presented with new masses in the nuchal area and abdominal wall, both of which were resected and proven to be medulloblastoma metastases. The authors suggested a mechanism of direct implantation during surgery, as the location of disease would be atypical for hematogenous or lymphatic spread. Our patient had an uncommon presentation of medulloblastoma recurrence within a nuchal incisional scar several years after his surgery. To our knowledge this has only been described once in the literature. 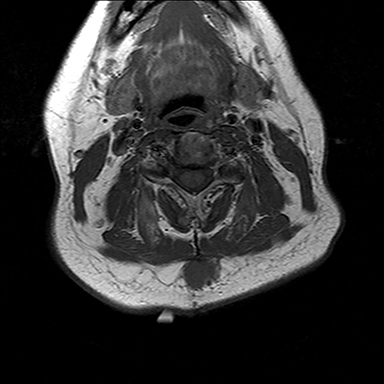 MRI was useful in characterizing the palpable nuchal mass; however, pathological analysis was necessary to definitively determine the malignant nature of this lesion. This rare case adds to the data that delayed surgical tract metastases can occur even lacking other areas of recurrence, and should be included in the differential diagnosis of a growing palpable scar mass despite a delay between surgery and presentation. Galarza M., Sosa F. Pure subcutaneous seeding from medulloblastoma. Pediatr Neurol. 2003;29:245-249. Eberhart CG, Cohen KJ, Tihan T, et al. Medulloblastomas with systemic metastases: Evaluation of tumor histopathology and clinical behavior in 23 patients. J Pediatr Hematol Oncol. 2003;25:3:198-203. Tarbell N., Loeffler J., Silver B., et al. The change in patterns of relapse in medulloblastoma. Cancer. 1991;68:1600-1604. Alden D, Hallstrom J. Delayed incision tract medulloblastoma metastasis in an adult. Appl Radiol. 2017;46(3):46-47. Prepared by Dr. Alden while a Radiology Resident, and Dr. Hallstrom while an Assistant Professor of Neuroradiology at the University of New Mexico Health Sciences Center in Albuquerque, NM.